I have been banging on for weeks, months even, about building a classic wardrobe filled with pieces that i would want to wear time and time again. Well i’ve just added a new piece to the click. Enter The Grey Longline Waistcoat. 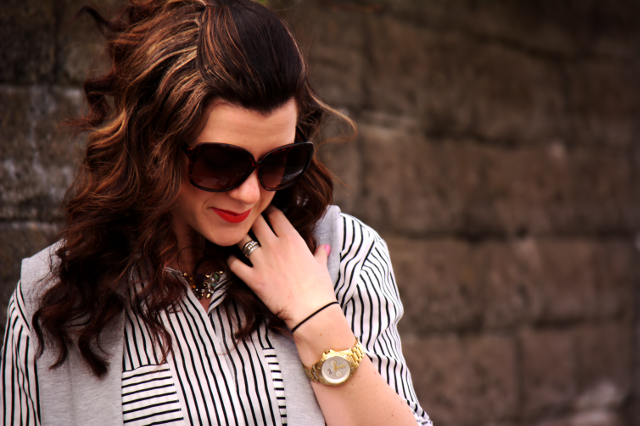 Its big news in my wardrobe and it is perfect for spring. 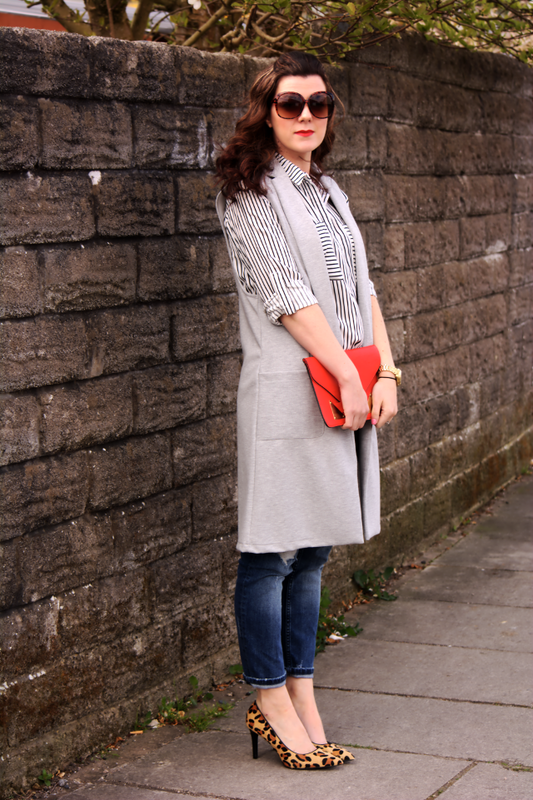 I love how its neutrality adds a little something to an outfit, an extra layer adds extra interest. So what to wear with a waistcoat (or vest as my international pals would call it)? Well i added in some more classic pieces in to the mix. 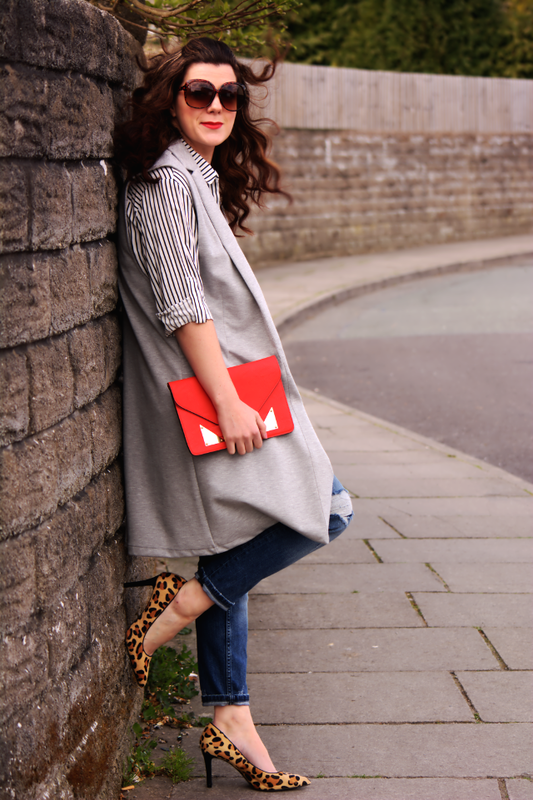 My favourite leopard print heels, ripped jeans, a black and white striped shirt and a pop of colour with the clutch. All of these items are key players in my everyday dressing, and by adding them all together makes for one classic outfit and one happy gal. I’m building a wardrobe piece by piece of items that i love to wear. It makes getting dressed every morning a damn site easier i tell you. I have however just been packing away some of my winter woolies and pulling out some of the spring summer items, ready to do my seasonal switch, and i have to say there is not a great deal of things that i want to carry over from last summer. There’s a few maxi dresses i love that will, a few jackets and some blouses. But apart from that not a great deal. I am not a big fan of shopping for summer, i think thats the Brit in me, being in Blighty means you never know what kind of summer you’re going to get (mostly wet is what i pre-empt), so that makes shopping a leetle more difficult. But i am going to embrace the change, get rid, sell or donate a lot and take it from there. What are you planning on purchasing this summer? Any summer wardrobe tips ? This is such a chic look! The leopard pumps are the perfect, classic finishing touch! It makes life so much easier if you have a (smaller) wardrobe full of classics that you really love. And those shoes are certainly classic! I've been wanting to get leopard print flats for quite some time. "First of all your willingness to go outside of your normal topic range and try a new slant (talking about fashion blogging!) certainly caught my eye, so that’s a great example in itself–trying new things to get new readers. A waistcoat is on my wishlist at the moment. During the last year I've been getting rid of more than I bought so that in the end (it's still a work in progress, but so are we) I will have more or less only items I love to wear in there. And even tho the last summer hasn't been that great here either, I am happy I can get out my lighter clothing now and I am afraid I actually love to shop for tops. Not so much bottoms. Love your style! 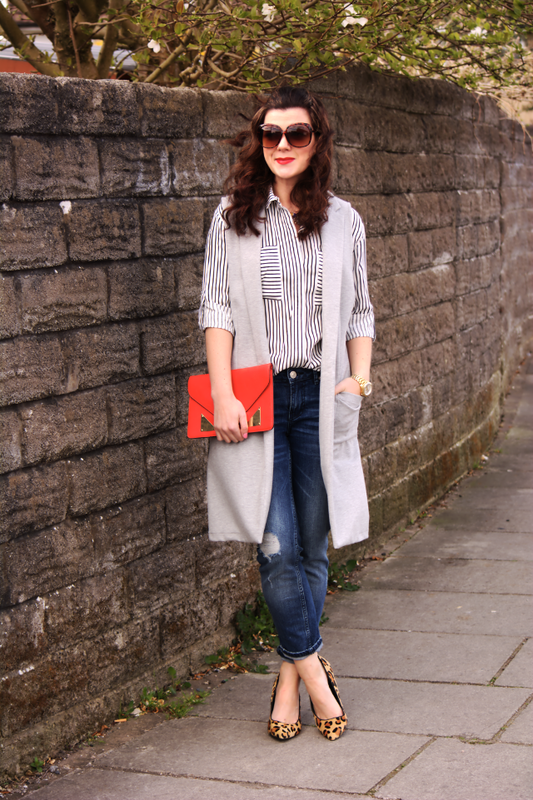 the vest is super chic! thank you for hosting a link up! Love the shoes! I'm always a sucker for leopard print! I already put my winter clothes away about a month ago. I don't care if it is still snowing! Lol! I plan to invest in some classic pieces so I can wear many times and still look amazing. I am trying to reduce my shopping and currently I only shop twice a month. ah coming from Greece I always know what kind of summer I am up to: hot and dry! I have lots of summer clothes so I don't think I need anything, but I do need a couple of pairs of sandals as the ones I own are worn out! 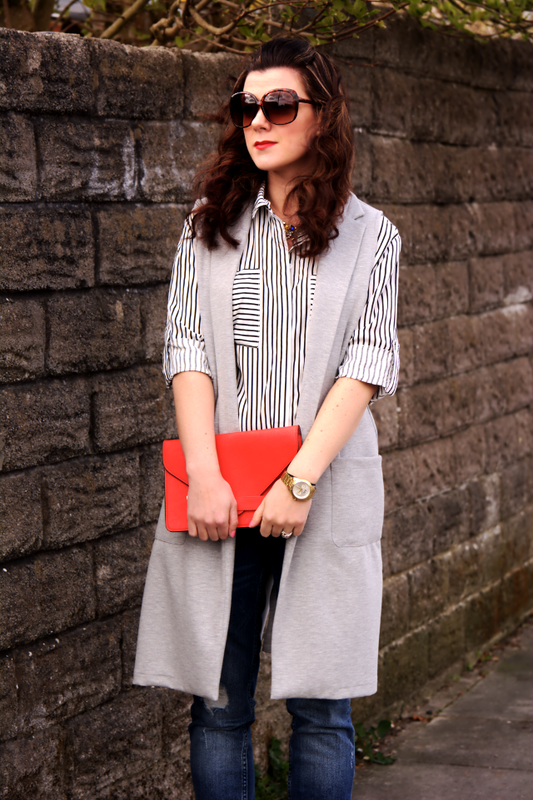 I love this vest and how it adds a fun layer to an already fab outfit. Nothing is on my wishlist and I guess that's a good thing since I have way too much clothes. Wow! You look gorgeous! I absolutely love that coat, and your outfit is beautifully put together. I love that each of these pieces can stand alone and yet go so well together. Great look! I love the chic simplicity of this outfit. The pop of red in the clutch and the leopard heels are inspired and really make the outfit. We actually woke up to snow 2 days ago!!! Okay…it didn't stay, but Spring still hasn't shown up and I'm worried we might not get summer either. 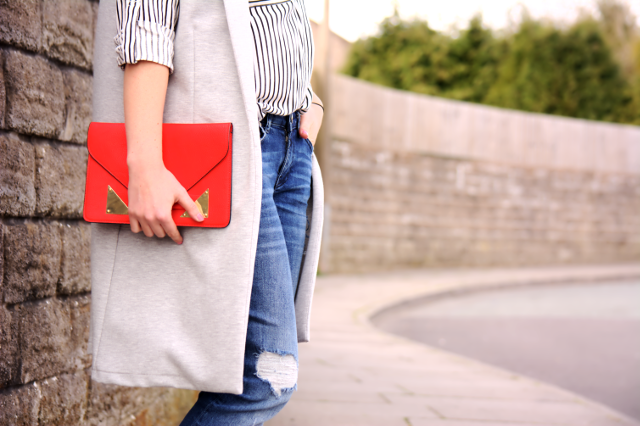 This red clutch is a perfect touch to this outfit! Oh my! This is ever so chic! And your hair….GORGEOUS!!!! !